Orders in by 11 am, are ready by 4 pm. So much drycleaning, so little time. That’s why Best Cleaners makes it easy to get your order in and out on the same day. Drop off your dry cleaning and shirts by 11 am, and we’ll have them crisp and ready by 4 pm, Monday through Saturday. Just swing by on your way home from work. Best Cleaners is open until 7 pm on weekdays, with special extended hours depending on the location. When you’re in a rush, use our 24-hour drop box to leave us your order. Here’s a quick link to our prices for cleaning most items. Express Bag Service Saves You a Bundle. Want to save time as well as money on your weekly drycleaning? 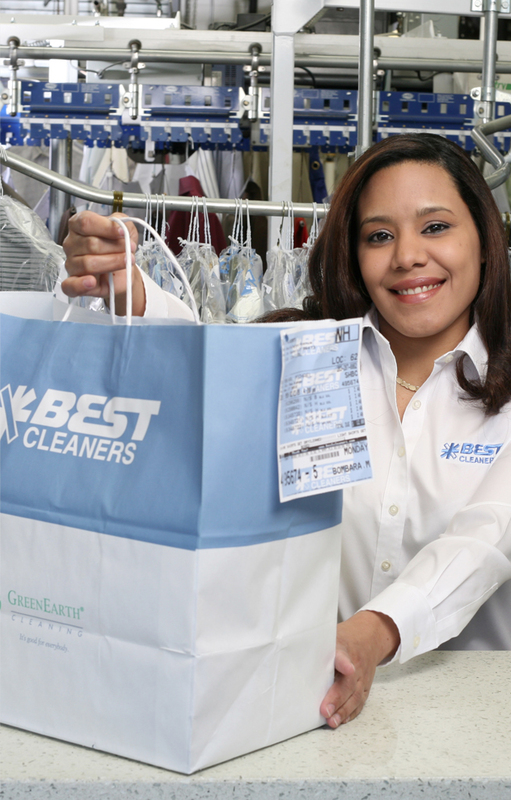 Best Cleaners’ Express Bag service is your best bet. Just ask for a free express bag at the counter. Stuff it and drop it in the 24-hour drop box anytime. Plus, if you don’t want to wait to pay when picking up your order, sign up for Best’s V.I.P. express service. We keep your credit card number on file and you simply pick up your order and go. The savings don’t end there. The more orders we service, the more money you’ll save. Here’s how it works: For every $15 you spend, your express bag card is stamped once. A $30 order gets two stamps, and a $45 order gets three. When your card is full, you’ll get 50% off your next express bag, no matter how much is in it. So fill it up. But first, sign up. Complete your application, bring it to any Best Cleaners’ location, and you’re off and running. With a little more time on your hands. And a little more cash in your pocket. Compliments of Best.